Home made tomato bisque and grilled cheese. Go to http://foodwishes.blogspot.com/2013/10/tomato-bisque-soup-might-not-count-as.html for the recipe and video. Everything he does is great. He takes much of the mystery out of some classic dishes.
. I decided to make a trial run of sweet potato souffle before Thanksgiving. It’s got all the same stuff that Mama’s casserole does, just put together differently. Use 1 tbs butter, 1 tbs flour to make a quick white roux and add 1/2 cup cold milk to the roux for a classic Bechamel sauce. Let cool. Combine white sauce with 8 oz (by weight) of cooked, peeled and cooled sweet potato, 2 tbs sugar, 1 tsp cinnamon, 1/2 tsp nutmeg, 1/4 tsp allspice, 1/2 tsp vanilla extract, 2 egg yolks and blend/whisk smooth. Begin whipping 2 egg whites, add 1/2 tbs sugar when they begin to stiffen, continue whipping and add another 1/2 tbs sugar when it starts to hold a peak and continue to whip until it resembles the sheen and stiffness of shaving cream. Fold half the meringue into the the sweet potato mixture at a time making sure not to be too aggressive mixing them together. Simply fold until all the white color has turned the same color as the sweet potato mixture. liberally butter and sugar the bottom and sides of (4) 8 oz baking Ramekins (small, straight-sided bowls), scoop mixture into bowls and bake in 400 degree oven until tops just start to brown ~20-25 minutes. Present it hot and finished with powdered sugar before it falls, but let cool some before enjoying. Again, the same flavors as Mom’s but now with the lighter texture and elegant presentation. With Thanksgiving coming up it’s time for some home cookin’. This is 1/2 the recipe at the bottom of the back of the card. Mix well and cook in buttered dish at 325 about 45 to 50 minutes until middle rises. Move to bottom rack if you add the pecan topping. I prefer it without the topping. Also don’t be afraid to brown the edges, the sugars caramelize and get nice and gooey. 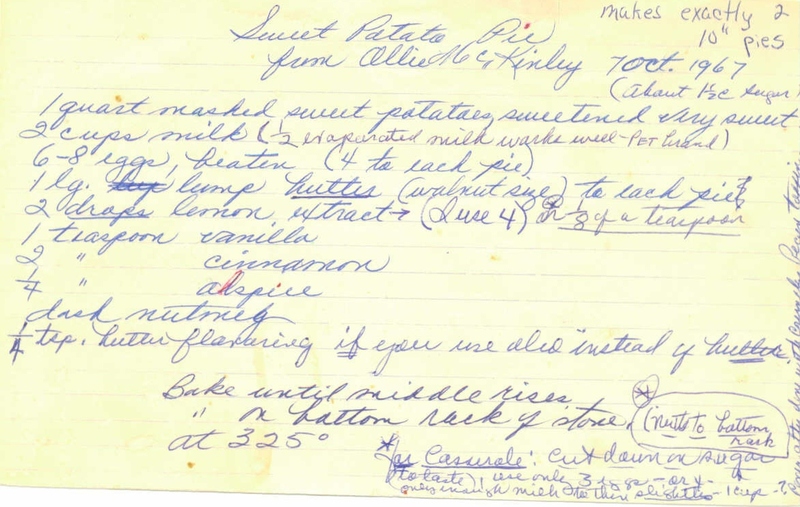 The interesting thing about all of Mother’s recipe cards is that she dated and credited them. Also, how they changed over time and how her communication was really intended for her and intent is not always clear. There are a lot of secrets NOT on the cards. For instance, she sweetens her sweet potatoes after they are cooked and peeled and still hot, adding 1 1/2 cups of sugar per quart. Sweeten to your taste, I only use 1 cup. Listened to Dexter and Freddie lay it DOWN on Bluenote vinyl from 1965 with a leftovers frittata.